Prominent & Leading Manufacturer from Faridabad, we offer plastic speed bumps, speed bumps and strip speed bumps. 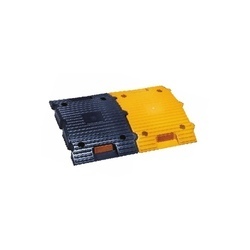 Available under model no ASB-ABS-75 and in block size of 500 x 400 x75 mm, thesePlastic Speed Bumps are developed using superior grade plastic which make these last long. The bumps are developed as per industry standards and are also easy to install. Further, its sturdy finish also makes it withstand loads of heavy loaded vehicles. These speed bumps are also chemical & weather resistant and assist in reducing speed to desired levels. Also suitable to be used in parking areas, these are easy to install and can be made available in different length choices of 4' and 6'. The presence of embedded tape also makes these provide for superior visibility even in poor light conditions. Plastic Speed Bumps are developed using superior grade plastic which make these last long. The bumps are developed as per industry standards and are also easy to install. Further, its sturdy finish also makes it withstand loads of heavy loaded vehicles. These speed bumps are also chemical & weather resistant and assist in reducing speed to desired levels. 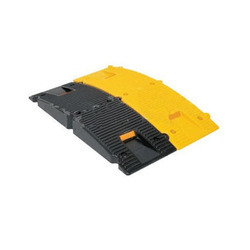 Available in model no ABS- ABS-751, theseSpeed Bumps are available in block size of 250x750x75 mm and provide for maintenance-free usage in parking areas. Also supporting enhanced safety, these come with channel bottom which facilitates quick drainage of clogged water. Available in rubber construction finish, these speed bumps also provide for long lasting usage for years even in rough working conditions. Providing complete safety from issues like wrapping, cracking and chipping, these provide for cost effective usage and come with embedded highly visible tape which offers superior visibility support even at night time. We can also offer these with options of cat-eye reflectors to further enhance the visibility factor. 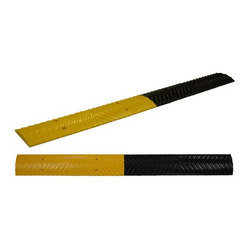 Providing complete safety from issues like wrapping, cracking and chipping, these Strip Speed Bumps provide for cost effective usage and come with embedded highly visible tape which offers superior visibility support even at night time. We can also offer these with options of cat-eye reflectors to further enhance the visibility factor.